People generally love kids, and with good reason. They’re innocent and sweet, good-natured, and have no real idea of the world and its complexities. However, there’s a distinct flipside to all this. What about children that are not so open-hearted, and possess a deep well of darkness? Perhaps we don’t encounter them in real life – thankfully – but the idea of a demonic child has provided much fodder for writers and filmmakers throughout history. Little else can strike fear in the heart of an adult more than a conniving child with an evil gleam in his or her eye. The question remains: what perversion leads a supposedly pure soul to transform into a harbinger of doom and destruction? Disturbingly, the question is not easily answered. Here are a few of the most evil children in pop culture; read on for a true, bone-chilling scare. This blue-eyed, sweet-faced boy is not at all what he seems. Sadly, his parents learned that the hard way. According to the original story, Damien was born on June 6th, at 6am – 666, the well-known numeric symbol of the devil – to a jackal, who died soon after giving birth. Orphaned, Damien was soon adopted by an American ambassador and his wife while on a mission in Great Britain. Beguiled by the cherubic infant, it takes the couple awhile to realize that something is amiss. Soon enough, things begin to go badly. The boy’s nanny is discovered to have hanged herself after his birthday party, proclaiming darkly that she did it for him as she tightened the noose. Things continue to take a strange turn, as the nanny is revealed to have been part of the town’s underground community of Satanists, who were eagerly awaiting Damien to help do his bidding from behind the scenes. Damien’s true nature begins to make itself known, and his parents are aghast at his violent reaction to church, or the frightened scurrying of animals at the mere sight of him. While on a trip to Italy, a priest who notices something off about Damien tells the ambassador that he believes the boy to be the antichrist. His father shrugs it off though, not taking the threat seriously. But much to his horror, he becomes convinced that Damien is indeed the devil. Especially when his wife is revealed to be pregnant, and a jealous Damien knocks her off the balcony as he rides his tricycle, murdering the unborn baby. More mayhem ensues as a journalist is decapitated, and the devil-child begins to cunningly push for his father’s dominance within the political realm. The film then shifts to the father’s attempts to kill off the wayward son, in a journey that takes him to far-flung places in the Middle East as the violence is ratcheted up at an unbelievable pace. 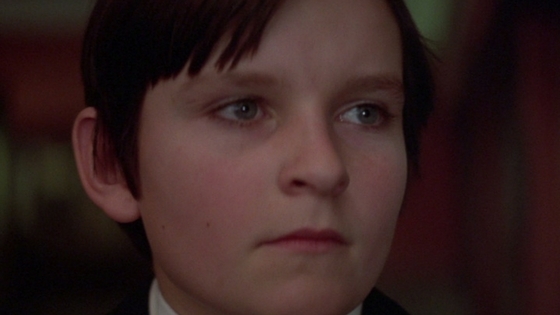 The Omen is now seen to exemplify one of the best and subversive horror films of the 1970s, with a main character that interrogates man’s relation to his surroundings and inherent barbarism. One that mankind has tried to rid himself of through the totems of civilization. Perhaps the first demonic child to become very well-known in the realm of literature is Rhoda Penmark, in a novel written by William March, published in 1954. The film treatment would debut merely two years later. Rhoda captured the imagination of 1950s America in a way that is impossible to underestimate. The idea that a mother could give birth to a “bad seed” tinged many a woman’s heart with ice-cold fear. Outwardly, Rhoda was the perfect child: hair drawn in pigtails, polite and demure. Adults loved her, and felt she was the perfect child. However, other kids her age kept a safe distance, and with good reason. They understood that something was odd about the young girl, and her explosion of random violence was something only they were privy to. Things somewhat change when the girl’s mother, Christine, begins to take note of her hostility to a fellow classmate, Claude. The boy mysteriously drowned in a local lake, and is found with crescent shaped marks imprinted on his face. Christine notices her daughter’s indifference, and soon learns that Rhoda had quarreled with Claude over a perfect penmanship medal she felt she deserved more. Further, when Christine confronts her daughter about the last time she’d seen Claude, she discovers that her precious daughter had lied to her. Mulling over Rhoda’s strange deception, Christine begins to remember other disturbing incidents from the past. Past murders and horrifying mishaps begin to take a stunningly dark shape, and she soon learns that Rhoda is harboring deeply murderous tendencies. As their lives begins to unravel, Christine becomes determined to kill her daughter…and without bringing on any spoilers, let’s just say that the ending is absolutely heartbreaking. The Bad Seed lead to intense public debate regarding nature vs. nurture; whether or not a person is born evil or becomes that way due to the surrounding environment. What ensures both the book’s and film’s continuing legacy is that it offers no easy resolution. And the universe’s dark mystery remains completely unsolved. Another work that has haunted the psyche of many a new mother is Rosemary’s Baby, whose central theme is the horror a woman feels at the unknown entity she is carrying within her womb. The book first written in 1967 by Ira Levin, and later adapted into a film by the same name in 1968, remains a landmark in the horror genre, and one of the most devastating portrayals of motherhood being turned on its head. It tells the story of Rosemary Woodhouse, a newlywed who moves into the Bramford, a gothic revival building in New York City with her husband, Guy, a struggling actor. They are warned that the place possesses a disturbing history involving witchcraft and murder, but admonishing it as nonsense, decide to ignore. Rosemary is desperate to start a family, but Guy is hoping to wait a bit ‘til he feels he is more established. The young couple is warmly welcomed by the quirky Minnie and Roman Castevat, their neighbors in the Bramford. While Rosemary finds herself with little patience for the erstwhile couple, Guy is taken by them, and he begins to visit them frequently. After a potent rival in the theater mysteriously goes blind, Guy is given an important stage role, and immediately afterward agrees with Rosemary that it is time for them to start a family. While initially delighted by this development, Rosemary begins to suspect that something is amiss. However, she is unable to pinpoint the exact nature of the problem ‘til her friend warns her that she discovered their neighbors are leaders of a Satanic coven. Frightened to her core, Rosemary begins to feel that they might want to steal her child to sacrifice it to the devil. Bewildered and frantic, Rosemary embarks on a quest to find someone – anyone – who will believe her, and help. But no one is convinced, and she realizes that she is out on her own in this battle, her husband being the worst villain of all. The day Rosemary gives birth to her baby is one that will live on in pop culture infamy. The scream, “His eyes! His eyes!” remains absolutely blood-curdling, as she realizes that her neighbors don’t want to sacrifice her child to the devil, but rather, she has given birth to the devil. Touching on perhaps every unspoken fear a new mother might have regarding the alien-like being sprouting from her womb, Rosemary’s Baby is one of the most terrifying works of psychological horror, ever. Moving away a bit from the realm of horror literature and film, we start here with a brief look into the world of true crime, and all the bizarre and truly horrifying stories it offers. Perhaps few stories are as damning and terrible as that of Eric Smith, a kid who heralded the beginning of his teen years by abusing and murdering a defenseless four year old named Derrick. In the summer of 1993, Derrick and Eric went to the same baseball program about a block away from Derrick’s home. Derrick’s mom was caring for her young son when she tragically allowed him to walk home the one block from baseball practice by himself. Eric followed the young boy, easily convincing him to go into the forest. There, Eric horrifically abused and murdered Derrick, and left his body for the authorities to find hours later. Eric admitted to the murder, but never gave a clear reason why. The incident made national headlines for the terribly young ages of both the perpetrator and the victim. Eric was sentenced to juvenile prison, and in further investigations as to how something so horrifying could occur, it was revealed that his mother may have taken epilepsy drugs during her pregnancy. Of course, the finding does not fully explain the matter of Derrick’s horrible fate. Jesse Pomeroy earned a reputation in local Massachusetts folklore as the youngest and most brutal murderer ever. Born in 1859, he committed horrifying acts against other children at the tender age of eleven. He would tie them up and torture them, pretending that they were only playing house – that is, his own demented version of house. Jesse was sent to reform school, with the hopes that what was then seen as his boyish roughhousing would be tamed. Although he was supposed to stay there ‘til he turned 21, he was released just a year and a half later on good behavior. A mere three years later, Jesse brutally murdered a four year old boy who was later found mutilated in Dorchester Bay, with several knife wounds throughout his fragile body, and blood pouring from his eyes. Jesse was subsequently sentenced to life in prison; solitary confinement to be exact, ‘til his death at the age of 72. Perhaps the notion of an evil child strikes fear in our hearts because there is so much that is unknown: is it possible to know before bringing them into this world that a kid could be a sick murder, or the spawn of the devil? And who does the parent blame? Is it themselves, or society, for the grave brutalities their sweet children commit. It’s impossible to know, and the dark contours of that very mystery will always contribute to the public’s fascination with demonic children.